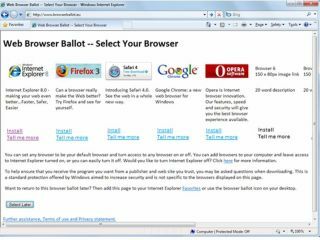 Microsoft's proposals to offer a 'ballot screen' to let users select the web browser they want during installation suggests that (apart from the ballot screen), European versions of Windows 7 wouldn't be any different from the copies sold in the US. In Microsoft's own words: "Microsoft will ship Windows in Europe with the full functionality available in the rest of the world". But although a Microsoft spokesperson has confirmed that "the proposals will also cover boxed copies of Windows sold in Europe", they couldn't say if that means the end of forcing Vista users in Europe to do a clean install instead of an in-place upgrade. "Everything's just at proposal stage", Microsoft spokesperson Catherine Brooker told us, "so specifics of how the upgrade process would work would just be speculation right now." But with an eye on the 'clean install only' scenario for European users upgrading from Vista (and for XP users worldwide), Microsoft is now creating extra tools to simplify moving documents, files and settings to the clean install. "The Windows folks are actually working on a bunch of tools to help customers in migrating who have to do a clean install," says Brooker, "and that includes folks upgrading from XP as well as with the N and E versions. "Windows Easy Transfer is one example of tools that Microsoft already provides today, but the engineering folks are working on additional tools as well – more details will be coming on the others as launch gets closer." Brooker also points out that as things stand, Europe actually gets a better deal for users who don't mind the clean install; "customers can purchase the full version for an equivalent upgrade price".